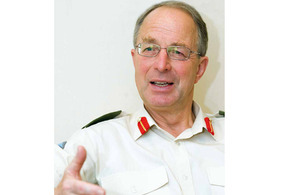 Chief of the Defence Staff (CDS) General Sir David Richards talks to Amba Wade about the Defence Vision. It’s not every day you meet the Chief of the Defence Staff and ask him to explain what the Defence Vision means to him and how the changes it brings can affect everyone. There is no denying that there is sweeping change taking place within the Armed Forces and the civilian workforce, at home and overseas. We will look different and act differently, both as a department of state and as a military HQ. The impacts are going to be felt for years to come. Transforming Defence will deliver the Vision of smaller but still ‘battle-winning’ Armed Forces supported by ‘a smaller more professional MOD’ and a ‘more hard-headed approach to what we can afford’. Transforming Defence is the biggest change programme to take place for decades. Driven by the Strategic Defence and Security Review (SDSR) and the recommendations in Lord Levene’s report, the savings the MOD must make at its very heart are forcing us to look closely at ourselves and how we think, behave and conduct our business outside operations. This is not just top-down change; everyone is being asked to ‘think Defence’ and ‘do it better’, from simple quick wins to supporting major change programmes across the board. The tight squeeze on resources is creating real opportunities to empower our people, eliminate waste and simplify how we do things. Some examples of new thinking and new ways of working are the Royal Navy’s ‘10 Small Steps’, the recent changes to how the Submarine Operating Centre provides business support, and the introduction of flexible resourcing within the HR Directorate. I think it’s all about team work. I view the Vision as tantamount to what we in the military refer to as unity of purpose and ‘Commanders’ Intent’. Many civil servants who have now been on operations with us also share this view. It’s being able to see where it is we should all be going, so the Vision enables people independently to act in support of it, without lots more detailed instructions or orders to achieve it. Defence has a unique DNA compared to every other department being asked to make savings. We mix two distinct cultures, the military and the civilian, which allows us to think and act in new ways other government departments simply cannot. You can really work very efficiently and with less bureaucratic top-down interference. I think Service personnel and civilians work very well together on the whole already, but they’re encumbered by too much bureaucracy. We just need to trust each other more at subordinate levels. We also have to decide what we don’t need to do. Maybe my Civil Service friends would say ‘you would say this’, but I think many of them would agree that the modus operandi used amongst the Armed Forces on operations is a very good one to use as a basis for how we should be working here in the MOD and at the top levels of Defence more widely within the Single Services. People will make mistakes, but reinvigorating the process of our daily business is worth that risk, and if we can bring that into our daily work in the MOD then it will be a much healthier place. The Vision demands realism about what we can afford in the future so that we avoid the budget black holes of the past. While much work is already being done to make efficiencies, there is still more to do. How much more change can we all take and still deliver everything the UK needs from Defence? Change isn’t necessarily bad; it’s uncertainty that is demoralising. I do think and hope that since the SDSR there is a sense that we now know our financial boundaries and there is a growing understanding in the Armed Forces of what we can do, what we can’t do, and how we might do things differently. The work we’re doing at the moment, mainly within the military, but integrated across Defence, is called ‘How We Fight’. This looks at finding new ways of achieving an objective, where once we might have gone about things in a certain way, but have decided that the equipment is not needed or not affordable. So we need to incorporate that novel, more hard-nosed sort of thinking into the Vision and give people the confidence that we can still produce the goods at the end of the day. So is the Vision of being ready to ‘address tomorrow’s threats’ realistic and achievable? After all, from 2014, there will be no more combat troops in Afghanistan and Future Force 2020 will reduce Regular Forces in size and increase the numbers of Reserve Forces. The civilian workforce will also be reduced. CDS is in no doubt that Defence would be more than equipped to meet all challenges. I’ve been around 41 years now in the Armed Forces. I’ve heard the view before that history is dead and there will be no more wars and no more conflicts and crises. As I look out at the world as it is and how it’s likely to evolve in the next 10 to 15 years I think there will be a huge demand, a continued demand, on the Armed Forces. With the fighting experience and combat maturity we’ve gained over the last 15 years I think we will continue to be a very effective, integrated joint force which will worry hugely our enemies when we turn up and hugely reassure our friends. This article is taken from the August 2012 issue of Defence Focus - the magazine for everyone in Defence.